With nearly 45 attendees, we set a record! 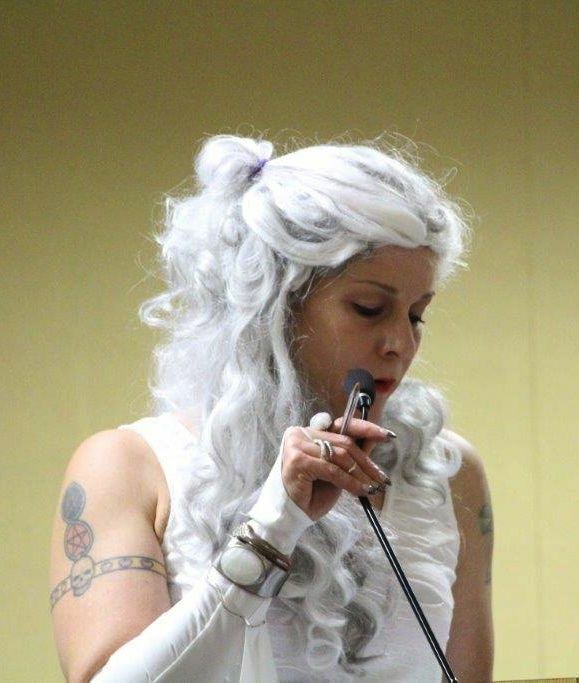 In between all the costumes, readings, nibbles, and door prizes, a theme quickly emerged at the CCCC Creative Writing Program event open mic on Friday: COMMUNITY! 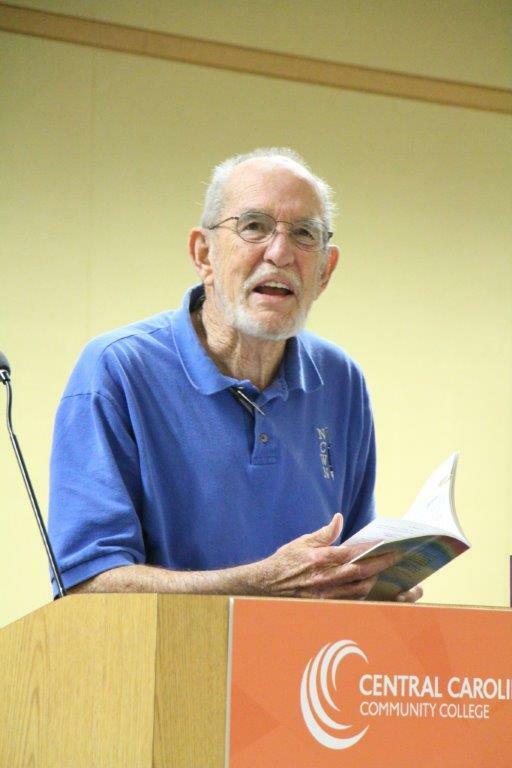 In addition to appearances by favorite local writers and fans, people came from as far away as Lee, Randolph, and Orange counties to read and savor the work of others. 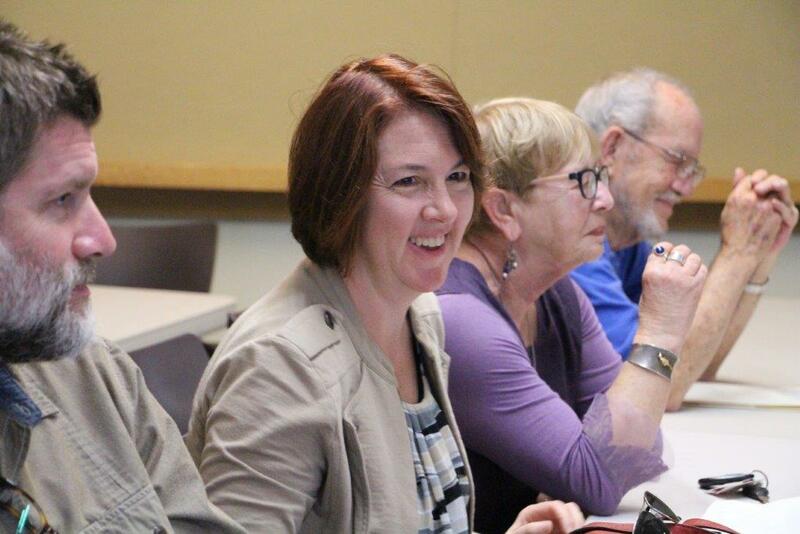 Robert Baggett, Kristy Baggett, Maggie Zwilling (CWP Program Coordinator) and Al Manning of the N.C. Writers’ Network. We were delighted to see Kristy Baggett, Director of Personal Enrichment at CCCC, who joined us with her husband Robert. To name just a few, local writers such as Karen Pullen, Al Manning, Mary Barnard Ruth Moose, Ralph Earle, Judith Stanton, Linda Johnson, and Michele Berger also joined us. Check out our new podium sign! Many thanks to Maggie Zwilling! 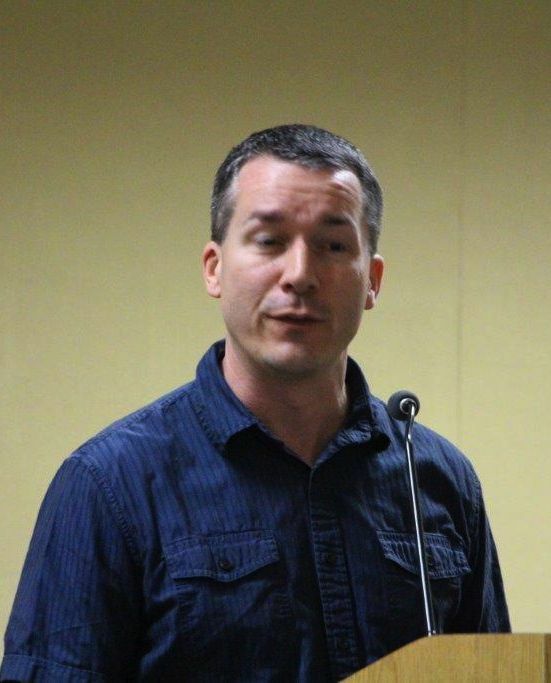 Chris was on the verge introducing the first reader when lo and behold in sashayed none other than Queen Elizabeth I, that legendary patron of Shakespeare and many other poets. 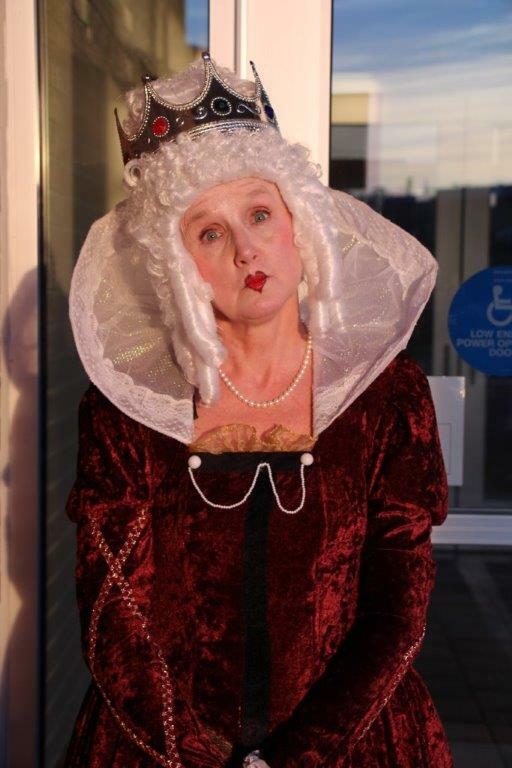 Susie Whorley, a talented and favorite local actress, brought Good Queen Bess to life again. Fittingly, the Queen transported us back to Elizabethan England, the home of the English sonnet. She regaled us with a reading of “When I Was Fair and Young” (penned by the Queen herself) and other Elizabethan favorites! The work shared (whether poems, essays, or fiction) was truly global, featuring settings as familiar as Pittsboro and as exotic as Africa. The universal emotions conveyed united us all: joy, laughter, grief, and fear. And this is how community is created. Chris then closed the event by thanking everyone and drawing three door prizes, which included published samples of several of the local writers. Scroll down to see more pictures of the event. And if you hadn’t been there, no worries, we’ll be holding another event in the spring. In the meantime, however, you can join our community by enrolling in any of the CWP Spring 2016 Courses, which will be available online soon. 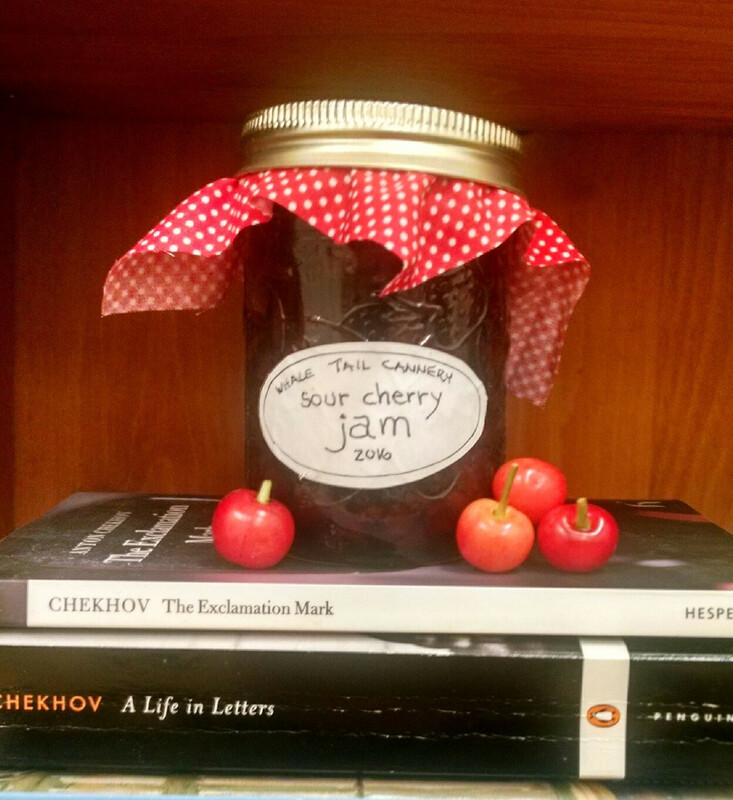 Photographs courtesy of CWP Board Member Mary Barnard, who pulled double duty as photographer AND poet extraordinare! 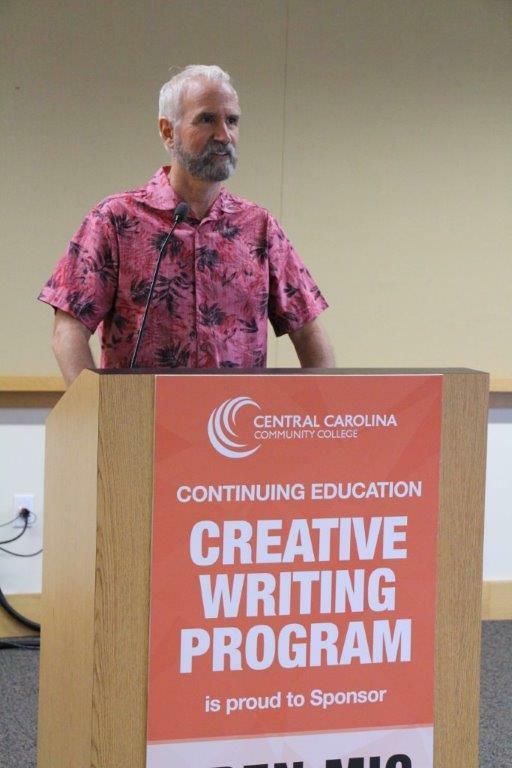 Ty Stumpf, CCCC Director of Humanities and N.C. Poetry Society Board Member, shared three wonderful poems. He is a regular favorite! This entry was posted in Uncategorized and tagged al manning, cccc, central carolina community college, Central Carolina Community College Creative Writing Program, chatham county, creative writing, judith stanton, karen pullen, kim overcash, north carolina writers network, open mic, pittsboro, pittsboro writers morning out, poetry fiction, ralph earle, ruth moose, ty stumpf on October 25, 2015 by Ashley Memory.